One aspect of the Genius system that customers love is the ability to seamlessly control the heating in different areas of their house, regardless of what type of heating it is: electric, underfloor or radiators. They can all be scheduled from the Genius Hub app. That’s why JK floorheating has chosen Genius as its recommended controls for their innovative in-ground underfloor heating (UFH). Their product is innovative, too, as it has no build-up height. The top screed is grooved using a specially designed and patented ‘JK floor grinder’. 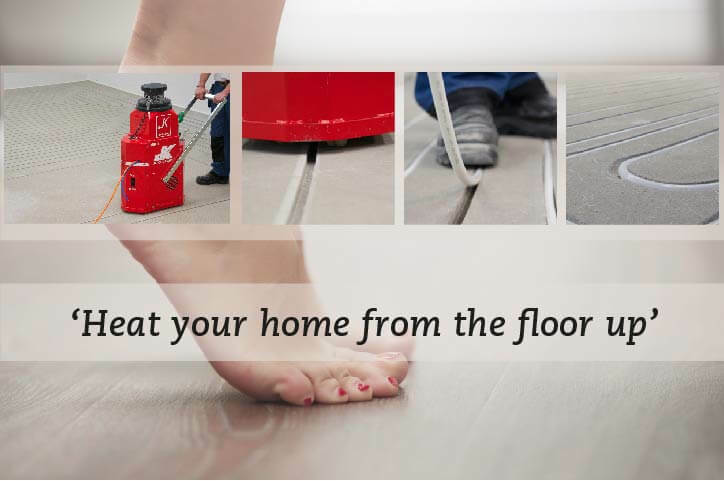 The JK floor grinder dustlessly creates grooves in the screed into which the heating pipes are laid. Genius controls and JK in-ground UFH is a great combination, because the lack of build-up height allows the floor temperature to rise much faster, so the room temperature can be controlled more accurately than with traditional underfloor heating systems. Using a Genius Room Sensor, the temperature of the room can be monitored and displayed on a graph, making it easy to pre-heat the room for exactly the right period. That way, the room can be the right temperature at the right time, without unnecessarily heating the room when it’s empty. Underfloor heating is a popular choice because of the wonderful feeling of heat underfoot, the aesthetic benefits and easy compatibility with heat pumps. The downside has always been the slow heat-up times that make it difficult to control. With JK in-ground UFH and Genius, that’s no longer a problem.